As an infant I had been what they call “officially blessed” in the Baptist church of Linköping in front of the congregation. As Baptists the congregants did not believe in any formal baptism of infants. My father, who in his younger years had been trained as an opera singer by respected names in that craft, was requested to perform at different locations in connection with marriage ceremonies, funerals and festivities hosted by different denominations. Every now and then, pastors and key people in the independent church (or charismatic movement of the time) visited our home. Revival meetings were held annually in a big tent at walking distance from where I lived. This was the environment in which I was raised. Down the road, while still in my teens, I finally got baptized by my own free will in another part of the country. Then in 1984 I traveled from the place of my baptism (a Baptist congregation in Hedemora), where I had been residing due to school studies, back to my parish of origin: Jonkoping. This city is sometimes called “the Swedish Jerusalem” in the vernacular. While there, I became a fulltime student at what was called the “Pentecostal Bible School” located at West Square. There we had some well-known evangelical teachers; I remember the author Leif Svensson the best. He appreciated the folkish cultures in Romania and what was then the Eastern bloc, where he had been traveling. Looking at some of his later texts today, I find that he was partly inspired by the Orthodoxy he had witnessed there; he thought there was something “missing” in our Christian worship in the West. Unfortunately, he lost his life together with a number of his pupils when the passenger ship Estonia sank at sea ten years later. I sense we could have had interesting conversations today, he and I, if he had been alive. At the bible school we learned not only Bible history and classical charismatic theology but also how to evangelize door to door in the field. Other topics included pastoral care, preaching and congregational knowledge. Upon finishing bible school, in addition to my compulsory military service, I decided to embark on an adventure that would take me as far from Sweden as possible. On my own I travelled to the Republic of South Africa –- a nation that was utterly detested by the Swedish government due to what was still left of the old apartheid policies. Nevertheless, I wanted to find out the truth about this country and its many tribes for myself. During my months there — thanks to establishing a network of helpful people by advertising in the press and exchanging personal mail in advance — I met with clergy, soldiers, elected officials, Blacks and Boer farmers among others. I was housed for some time in Bergville by Ds. Jannie DuPlessis and his young family who pastored the local mainstream congregation: the Dutch Reformed Church. This was a major Calvinist denomination, sanctioned by the South African government, which was heading in a somewhat more liberal theological direction. I could see indications that DuPlessis himself was beginning to have sympathies for the more hardline Calvinist splinter group: Afrikaans Protestant Church. Nevertheless, while I stayed in South Africa I witnessed many divisions within the community of believers. I soon recognized the fact that the different churches competed with each other over the alleged “truth.” This was the case even within the majority church of Calvinism! The pastors of some of these churches even made up their own theology, like Bert Steenkamp — the cancer-stricken leader of the sectarian Israel Visie, who I met just outside of Bloemfontein at his home. I recall we sat down in his bedroom office and he showed me his own hardbound revised version of the New Testament, which omitted the parts of the Scripture he felt contradicted the true gospel. This altogether made me lose hope in Christianity as a religion, even though I was still as of yet unfamiliar with Orthodoxy. At this time in my life, Christianity looked too divisive, with its many competing theological schools. It did not appear to be something that would provide cohesive strength for a nation and its people. With this on my mind I got married, raised five children (indeed a fulltime job! ), and put all my focus on various non-Christian ethno-political activities which made me a household name in Sweden during the remaining part of the 1980s and for the greater part of the 90s through TV, books and the printed press, for better or worse. Today I know that it was a mistake to pin my hope to this ethnic nationalism, because my own people were no longer synonymous with an understanding and defense of fundamental cultural values. I closed the doors to the many opportunities working with those of another background who had perhaps listened, and I preached almost entirely in vain for those who did not bother to hear my message. In the late 90’s my doubts had grown increasingly around whether or not I was on the right track as far as faith was concerned. I expressed this in letters to other people. I began to think that perhaps I had wasted my time, energy and money on the wrong projects, the wrong crowd. Science could not explain man’s spiritual needs; science only reduced man to one of several animals. The Orthodox writer Vladimir Lossky (d. 1958) once wrote that God introduced man finally to place him as a king in a paradise. But in the social Darwinist philosophy I had embraced, man was first a fish, then a monkey and then a human being. However, there was no explanation of how evolution suddenly stopped with Homo sapiens. Nor was there any real evidence of a direct evolutionary connection, but mostly a cluster of scientific theories with constant repetition eventually to be seen as a truth. I was forced to realize that what I had advocated for a number of years was, for the most part, morally, intellectually, and to some extent also scientifically untenable. What had begun as an intellectual and ideological stance would come to an end in the same way when I looked at it with more critical eyes. In 2004 I had been divorced for three years and was dating a young lady by the name of Sveta. She was a university student from the Russian industrial city of Izhevsk. I became not only charmed by this representative of Russian female beauty but also got a glimpse into a Russian culture and way of thinking until now quite unknown to me. It should be added that my curiosity about the Orthodox world had already begun with the war in the Balkans during the 1990s. I was hesitative regarding the media’s portrayal of one party in the conflict, the Serbs, as sheer evildoers and the other side as mere innocent victims. I was not alone in my suspicion. In 2006, I made yet another trip as a business consultant on behalf of Swedish clients to the Baltics. This time I had decided to visit the Orthodox cathedral in Riga, Latvia, and I asked my business contacts of Russian origin for directions. When I entered the building and witnessed its icons and its humble believers something beyond this world took a firm grip of my soul and mind. I had to find out more about this Orthodoxy, so different from anything else I had seen in my life. To take the plunge and become an Orthodox Christian was the best decision I have ever made. Once I had been an active anti-Communist activist who viewed “Russians” as the quintessential archenemy. Now, through my personal experiences in Eastern Europe and the Russian Orthodox believers I had met there, I had at last found my home within the rich spiritual and cultural treasury of Orthodoxy. I will not take all the credit myself. In retrospect, I know that there were people I have met along the way, who prayed for me. For me, Orthodoxy is mainly an individual spiritual standpoint. But besides this, it is also a cultural standpoint. Already in the mid-nineties, I had begun to realize that there was a kind of invisible boundary right across post-Cold War Europe. On the one hand, there was Protestantism with its chaos, cultural self-loathing and disrupted spirituality. On the other side of the border stood the Orthodox Byzantine world that had survived the dark years since 1917, and ironically thanks to the Cold War had not been flooded with foreign pop-culture and the materialism that has since replaced communism as the biggest existential threat to our cultural existence. In the post-Cold War era, the Eastern Orthodox world put up a cultural and spiritual barrier to the decadence of the West, which wanted to export and force this decadence upon them. Likewise, foreign governments give monetary support to those who question “the Russian way,” because the more fragmented the Russian Federation or her Orthodox neighbors are, the greater geopolitical advantage the Western politicians will receive. Under this consummately liberal mindset one finds the Orthodox Church to be just “one of several churches” on a large buffet line where you can pick and choose as you want as if truth, historical lineage and The Holy Tradition mean nothing. A critical reader could object and say that it is not that easy to make the Christian Orthodox message heard in Sweden today. Needless to say, there is indeed a spiritual and cultural war ahead of us. Indeed, it will require a combined numerical and cultural strength if we are to become something more than just a small group of idyll dreamers. This strength can be attained in forming a multifaceted alliance involving faith, culture and politics with the millions of people and numerous countries that view themselves as Orthodox. After all, these countries are in fact our next door neighbors. Hence, “geopolitics for believers.” With this alliance we will also reconnect with the old and best elements of a culture lost in a society so pre-occupied with individual Ego. 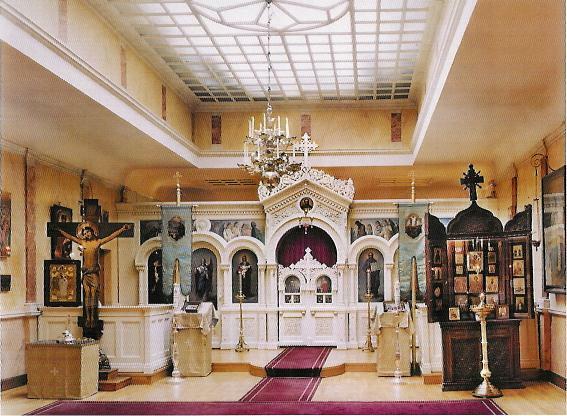 In a country like Sweden, so colored by the mentality of Protestantism and its inborn rebellious nature towards tradition, the Orthodox spiritual and cultural counter-revolution must either have a strong Orthodox immigrant presence in its midst, or alternatively have a Swedish leadership strongly rooted in the traditional Eastern Orthodox faith and Church. Anything else will guarantee that Swedes, even if professing to be orthodox, fall prey to the lures of modernism and ecumenism by habit. Finally, we also have to tie in with a force greater than the individual. We must tie in to God. We cannot succeed in this endeavor on our own.